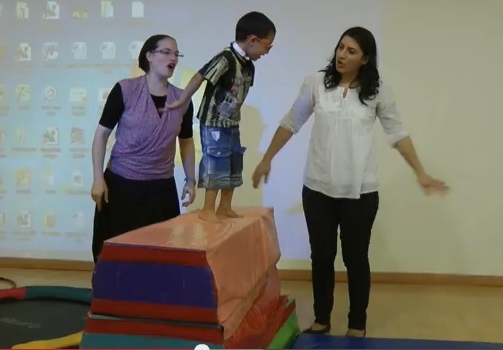 We are happy to share this clip of the Shachar Rehabilitation Educational Medical Day Care Center, on their end of the year party. You can see them perform their gymnastic exercises, with Hannah Primer-Shafran, their gymnastic teacher. Yes, like all kids, our kids at ALYN also love to jump, dance and be playful. But why should we settle for that? Like all kids, they love to master new tricks, and show them off. Hannah Primer-Shafran, gymnastic teacher and instructor says: "Gymnastics at "Shahar" serves that purpose and more! Besides fulfilling the obvious need for exercise, the kids get to experience a sense of physical mastery and self-efficacy, which cannot be taken for granted during their everyday lives. In addition, the gym classes are recreational by nature, and provide an opportunity for the kids to interact socially, to cooperate, to cheer and encourage each other on as they practice new skills. In this setting, it is the children who are often the ones to guide their instructor on how to best accomplish a physical goal; they become active partners in the learning process. Their success provides a motivating factor in attaining new goals and accomplishments. I am awed by our children, and am constantly reminded that no matter how many difficulties they may experience, they are first and foremost children."